Even as headlines depict Cambodian boys falling prey to traffickers luring them to virtual slave labor on Thai fishing boats, Laguna Beach resident Stan Frymann is making a bid to give them, and their sisters who end up in sweat shops, another option: a high school education. “If I cannot go to high school next year, I will be working hard at factory maybe for my whole life,” writes Chut Savry, a Cambodian girl who aspires to become a police woman, which requires a high school diploma. 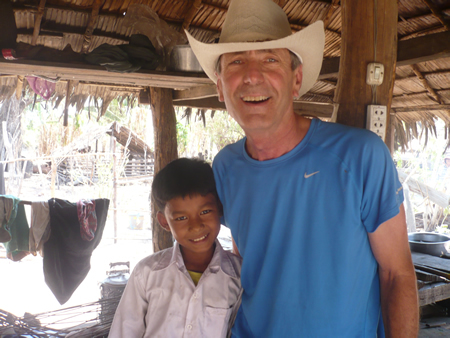 Laguna resident Stan Frymann visits the home of Sab Sar, one of the students he keeps from falling through the gaps in rural Cambodia’s school system.Photo courtesy of Stan Frymann. She’ll now have that chance, as a member of the first class of about 50 10th graders who will attend Laguna Beach Friendship High School, built on Frymann’s dime, when it opens this October in rural Cambodia southeast of the capital, Phnom Penh. Frymann didn’t set out to build a school in the commune (read “village”) of Tang Som Rong. In this village in Kampong Speu Province, the second poorest in Cambodia and a source of human trafficking, he wanted to give the boys and girls an alternative to hard labor. “In essence, not having $170 to fund three years of schooling [$50 for a bike and $40 per year for uniforms and supplies] was causing some of the brightest kids to drop out of school and begin a lifetime of working in sweatshop factories or in the fields at the end of elementary school,” he said. So he decided to sponsor 20 kids for middle school, grades seven through nine. As he tells it, he then realized that he was “only postponing the inevitable,” since there was no high school within walking or biking distance. So he decided to build one. “Fortunately, the Ministry of Education has actually begun to push for small high schools in remote locations, so the timing was perfect,” he said. Cambodia’s education infrastructure “is in dire need” of help in numerous areas, agreed Patty Waltcher, of Ojai, president of Lotus Outreach, which donated 750 bikes to girls in Cambodia. The organization twice received grants from the Laguna Beach-based charity Impact Giving. “Access to school is one of the main concerns in rural Cambodia,” Waltcher said, commending Frymann’s effort to help. Cambodia remains one of the poorest countries in Asia and relies on foreign assistance for a third of its budget, according to the U.S. State Department. Frymann’s penchant for philanthropy in education grew out of a 10-year teaching career that he ended in the mid 1990s when he transitioned into real estate. Reaching “unmotivated” students eluded him and he wishes he could have done more to inspire them. His remedy has been to withdraw his retirement pension and make it count for students who really need it. He ended up in Cambodia by trial and error, and “random chance,” he says. After exploring, and in some cases funding, projects in other countries, he was drawn to Cambodia, as a place that “seems to be making real progress,” and where “you can do a lot of good on a limited budget,” he said. The widespread use of U.S. dollars for transactions was another draw, along with the “warm and friendly people.” An abundance of snakes aside, he was hooked. The school will grow incrementally, starting with grade 10 and adding a grade each year, with a goal of accommodating 300 students, with two classes at each grade level, within a few years, he said. Construction begins this fall at the end of the wet season, so the building won’t be ready until spring, he said, but the new10th graders will begin class simultaneously, crowding in with the middle schoolers for the first term until their campus is ready. The Cambodian government pays the teachers, but there’s a catch, said Frymann. They pay a salary of $150 per month for morning classes, which is inadequate to live on. So standard practice is that the teachers offer “extra” classes in the afternoon for a fee. Only the best students can make the grade without the extra classes, so students who can’t afford them often drop out. Frymann plans to pay the teachers for their afternoon time up front, so that all students have access to the extra classes. Located so the middle schoolers can reach it by bike, Laguna Beach Friendship High School will also be the closest for another group of students, who live just beyond a day’s commute. To that end Frymann has added “snake proof” boys and girls dorms to the blueprint. They will house 14 residential students the first year and grow as the school grows. Non-snake-proof dorms would have been cheaper, said Frymann, but they opted for the “luxury” version. A local donor is footing the $2,000 for the dorms, but Frymann hopes to get a donor for the $300 well, as well as sponsors for the students. One of Frymann’s challenges in building the school has been to find a reliable point person on the ground in Cambodia managing the project, enrolling students and linking them to sponsors. The first person he engaged overcharged him and siphoned funds. Then Frymann serendipitously met Bodet Phey, a young man who had to drop out of university because his family was too poor. “In the most Buddhist nation in the world, an atheist sat down on a bench by a young Christian, and we talked about how many Christians talked the talk without walking the walk,” said Frymann. Frymann felt he could trust Phey, who said he embraced Christianity for its emphasis on helping the poor. And Frymann is helping Phey realize his ambition to become a teacher by sponsoring his university education while paying him a $150 a month stipend to manage the school project. “My dream is to connect individual sponsors here with individual children over there,” said Frymann. Ideally, anyone sponsoring a student’s three-year education for $170, would also correspond with them and get to know them. Frymann especially wants to build friendships between our community and theirs. And, with the warning that the school’s location is remote and viper encounters not uncommon, they would welcome volunteer English teachers and high-school level computer instruction, he said. I’m so grateful for the coverage of the upcoming Laguna Beach Friendship High School. If anyone is interested in sponsoring a student that can be done through the Rescue Task Force button in the article. If you would like to receive a letter from the student you sponsor, it would be helpful if you contacted me directly to arrange that. [email protected] I’m also glad to hear from anyone willing to help in any other way. How can I contact Stan?